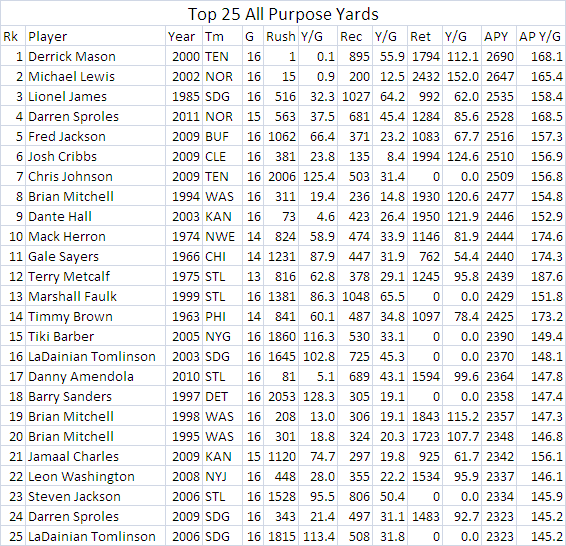 As you can see, Sproles is currently averaging 168.5 all purpose yards per game. In order to break the record, Sproles will need to get 163 yards in Sunday’s season finale. Working in Sproles’ favor is that the Saints will need to win in order to secure a 1st round bye and the #2 seed in the NFC – so expect him to get lots of touches. Furthermore, Sproles’ week 17 opponent – the Carolina Panthers – have given up more than 163 APY to 5 different players so far this year: Matt Forte (228 APY), Kevin Smith (201 APY), Chris Johnson (174 APY), Arian Foster (167 APY) and Maurice Jones-Drew (167 APY). 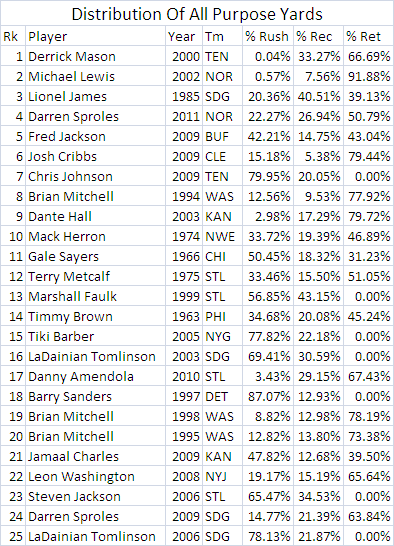 Sproles currently has just over 50% of his production from kick/punt returns and about 50% from offense. Only Mack Herron (1974), Terry Metcalf (1975) and Timmy Brown (1963) had a similar type of balance. However, Sproles’ offensive production is more balanced than the others: 22.3% of his yards come from rushing, 26.9% come from receiving. If Sproles manages to break Mason’s record on Sunday, he will cement himself as the best and most balanced all-purpose threat of all time.